Originally published under the title "Turkey: Land of Mosques, Prisons and the Uneducated." 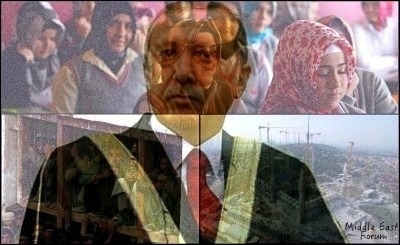 President Recep Tayyip Erdogan's Islamization of Turkey depends on religious schools, mosques, and prisons. One way the rise of Islamist authoritarianism in a country can be seen is by the rise in the number of mosques, religious schools and prisons -- coupled with a sharp decline in the quality of education. Turkey is no exception. Most recently, the Turkish government said that it would build 174 new prisons, increasing capacity by 100,000 convicts. This is Turkey's reply to complaints that six convicts must share a cell built for three. Convicts say they must sleep in turns in their bunk beds. Before that, Turkey's government released nearly 40,000 convicted criminals, in order to make space for tens of thousands of suspects, including journalists, businessmen and academics, detained after the failed coup of July 15. The other type of trendy building in Turkey is the mosque. Turkey's state-funded Directorate for Religious Affairs (Diyanet) has proudly announced that nearly 9,000 new mosques were built across the country between 2005 and 2015. Turkey has roughly twice as many mosques per capita as Iran. The number of mosques in Turkey is estimated at around 90,000, or one mosque per 866 people. Iran, with a similar population to Turkey's [nearly 78 million] boasts just 48,000 mosques. In other words, Turkey has twice as many mosques as the Islamic Republic of Iran, for roughly the same population. Egypt, which has a population -- nearly 90 million -- bigger than Turkey's, has 67,000 mosques. The growing efforts at Islamization of Turkish society have largely gone unnoticed. For many years, Islamization was the dog that did not bark: in spite of dire predictions by secularists, the [ruling] AKP did not introduce conspicuous efforts to Islamize Turkey. But since 2011, this has changed. The main exhibit is the education sector, which President Recep Tayyip Erdoğan has remodeled to instill considerably more Islamic content, in line with his stated purpose to raise "pious generations". Ultimately, the Islamic overhaul of the education system is bound to have implications for Turkey's civilizational identity, and on the choices it will make on where it belongs politically. In 2012, Erdogan's government introduced a contentious 12-year compulsory education system, paving the way for religious middle schools. In 2014, it introduced a scheme which forcibly enrolled about 40,000 students at imam schools. In some districts, imam schools were suddenly the only option for parents who could not afford private schooling. Also in 2014, the government granted permission for girls as young as 10 to wear Islamic headscarves in class. So, where does Turkey's increasingly Islamist education stand after all those efforts? According to a report released this month by the Organization for Economic Co-operation and Development (OECD), Turkey is one of the countries with the lowest spending per student. Turkey's public spending for primary and secondary school education, and its spending per university student, were all below the OECD average. The OECD study also found that 43% of Turkish women aged between 15 and 29 were neither working nor receiving education. The OECD average for that group is 17%. But it is not just about the quantitative findings; qualitative findings also point to an alarming education deficit in Turkey. In 2016, more than two million Turkish high school graduates took the annual national test to enroll at a post-secondary institution. According to the nationwide test results, the students scored an average 4.6 out of 40 questions in mathematics; 7.8 in science and 10.7 in humanities. Ironically, the test results show that the Turkish students do not even have adequate skills in their own language. The average score in Turkish was 19.1 out of 40. This is the inevitable outcome of systematic Islamization of society in general, and of education in particular, over the past 14 years. The next 14 years will doubtless be far bleaker.